The customer sets the flange drilling to match the system. Used for air, natural gas and other gas types. The intake valve is design to modulate, opening or closing to control the flow of air (or gas) into a system. The valve is operated pneumatically. 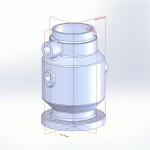 Air is applied to a control port pressurizing a piston. 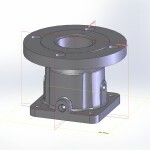 The piston opens or closes the valve, and a spring is used to return the valve to its starting position. 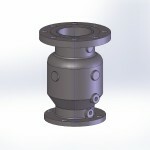 The intake valves are design with an independent poppet so that back flow is prevented. The intake can be design as normally open or normally closed. 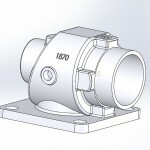 A normally open valve would have to be modulated closed for the system to be closed at start-up. A typical use is to control the airflow into a rotary screw compressor. The valve would be modulated open or closed by the compressor control system to meet downstream air demands. The independent poppet would prevent backflow into the air filter and loss of compressor oil due to reverse flow in the compressor.